The summer and fall of 1848 Salisbury endured an alarming epidemic of typhoid fever. At least 13 deaths occured in the Salisbury area. Because the population at the time was roughly 200 this was considered a high mortality rate. An edpidemic of diphtheria overtook the town and surrounding area in the fall and winter of 1861. There was an unusual number of deaths both of children and adults. The Yowler family suffered the loss of all seven of their children. Diphtheria is an acute infectious disease acquired by contact with an infected person or a carrier of the disease. It was usually confined to the upper respiratory tract (throat) and characterized by the formation of a tough membrane (false membrane) attached firmly to the underlying tissue that would bleed if forcibly removed. In the nineteenth century the disease was occasionally confused with scarlet fever and croup. Frost On June 4, 1859 there was a heavy frost that destroyed the crops and vegetation. Summer turned to autumn. The trees shed their leaves. The people of Salisbury knew they had to recoup the losses by growing another crop. They decided to grow buckwheat. The results were phenomenal. Elk-Lick township grew a bumper crop! December 1848 -- Loss: Newly built home of Benjamin DeHaven. 1850 -- Loss: Home of Jonathan Kelso and two carpenter shops. 1851 -- Loss: Hotel owned by Benjamin DeHaven. 1868 -- Loss: Homes of Peter S. Hay, Ambrose Breig and Peter Welfley. March 18, 1895 -- Loss: Office of Peter Livengood, Henry Loechel Hotel, The Livengood and Saylor store, Doctor Speicher's home. A drug store, harness and barber shop. Total property loss exceeded $40,000. April 8, 1895 -- Loss: Hotel owned by Drusilla Hay, wagon making shop,and meat market. September 16, 1924 -- Loss: The McKinley Building, the Loechel Hotel, Frank Keefer's grocery, a pool room, a restaurant and the Hay Hotel. A number of other buildings were damage. The above photo was taken the morning after the fire. In 1918 the Salisbury area was hard hit by the influenza epidemic. It is said that a wagon would go down the street each day picking up the dead. This illness would often take lives very quickly. 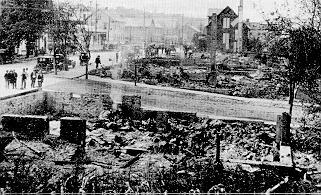 Hurricane Hazel struck Salisbury Oct 13-15, 1954. Pictured here is the Salisbury branch of the Baltimore and Ohio Railroad. 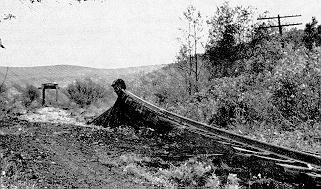 Flood waters tore the railroad bed to pieces and stood the ties on end. Paved roads were washed away, people were stranded in homes and vehicles. Two men, George Hillegas and William Petry died from heart attacks provoked by the flood. Abe Shoemaker drowned during Hurricane Hazel.